The residential sector has been thriving, supported by factors like a rapidly growing middle class. This has seen an increase in disposable income, allowing more people to afford to buy their own homes. Owning a home is the ultimate dream for many, and affordable housing is the solution for those who cannot build for themselves due to varying factors. It helps that there’s renewed focus on affordable housing from both public and private sectors. With that said, buying a house is exciting, but one should keep in mind that it is a long-term investment. The road to the dream is paved with many potential mistakes, but these can be avoided if the process is approached with caution. Here are seven potential land mines first-time home-buyers should aim to sidestep. As much as getting a piece of real estate within the ‘right’ address or neighbourhood is recommended, this should not be a priority. Many people lose sight of getting value for money just to own a house in a neighbourhood they’d want their friends to know about. To avoid the blind allure of crowd choices, list what your ideal home should be like, as well as the ideal location – but prioritise getting value for your money. 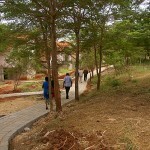 Many real estate agents sell property on the basis of a ‘Government-promised’ access road to the tarmac. Implementation of such infrastructure projects takes a considerable amount of time. Weigh if the benefits of the promise are worth the wait. Unfortunately, some people choose where to live based on where people of their community or economic class tend to gravitate towards. Considering that the house you buy could end up being your lifetime residence, plan your purchase with what matters to you in mind. The important things could be proximity to your workplace, your family, or amenities like schools, hospitals and police stations. Does your developer have a track record of quality finishes or finishing in time if you’re buying off-plan? Make a point of visiting the developer’s previous houses or apartments to assess the quality of work and maintenance of communal areas once the project is done. This will give you a clearer idea of the actual product and answer questions, such as whether the developer takes up the role of facilities management. The devil is in the details. One should always keep in mind that there are other costs in addition to the buying price. These include legal fees, stamp duty, maintenance costs and service charges, which more often than not are largely dependent on the neighbourhood and type of project built. Ensure you understand how much other developments in the area cost, and whether the deal you’re considering is too expensive or is in tandem with the market average. What do you hope the size of your family will be in five years’ time. Will you need to move into a bigger house? Will the children move out and leave you with a nearly empty five-bedroom house? Is it a house you can comfortably grow old in? These are important to think about. 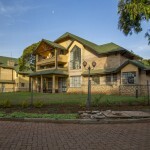 For instance, for a couple approaching retirement and whose children no longer need to live in their parents’ house, would getting a three-bedroom villa with two domestic servants’ quarters (DSQs) work better than a five-bedroom house? With the first option, the DSQs can be let out or used to accommodate guests. 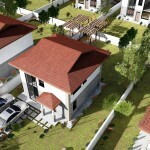 When investing in a home, conduct thorough land-use due diligence for the area. What are the possibilities that the face of the area will change in the future? If it’s a low-rise designated area, are the regulations strict or controlled enough? Are there upcoming high-rise buildings that have been approved? As a first-time buyer, chances are that you’re more susceptible to hidden mistakes that could be financially and emotionally expensive. However, as tedious as the process can be, you must continuously educate yourself to remain in the know. Talking to real estate experts and reading research reports would help. Additionally, before parting with your money, ensure that you are financially stable to make the purchase. To avoid future financial constraints, budget and get your finances in order first and then identify a home based on the budget – not the other way round. For mortgage buyers, ensure you understand the size of mortgage you are eligible for from your financier. A mortgage is reliant on factors like the size of your income and the house deposit. More importantly, understand the repayment plan, which is also determined by your age and current interest rates. 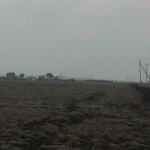 ‘Agricultural land’ or farm lands cannot be acquired by foreign individuals. ‘Agricultural land’ is usually owned by indigenous people. If purchase is made through a company – the majority of which must be Kenyan-owned – then it is allowed. The land will be bought under the company’s name. 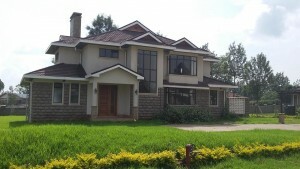 The first step to purchasing property in Kenya is to hire a real estate lawyer. A title search on the property is very important as many areas are not registered. Once property has been chosen and a price is agreed upon, the lawyer prepares a sale agreement as a conditional preliminary contract, signed by both parties. Upon execution, the buyer pays a deposit of 10% to 30% of the purchase price, which is usually refundable if the seller defaults on the transaction. The lawyer submits the documents to the Lands Office to be able to register the transfer, including the original title held by the seller, clearance certificates, consent transfer and the form for valuation for stamp duty. At the same time, the buyer settles the remaining balance with the vendor. Taxes and lawyer fees is paid within 30 days from closing. It is possible to purchase in Kenya without being in the country. One can assign a lawyer to go through the whole process on the buyer’s behalf through a power of attorney. Second, you will instinctively know it. Right now you’re probably wondering how you will know that you have found the right house if you don’t sleep on it. What’s wrong with sleeping on it? Everything is wrong with sleeping on it. Trust yourself. Don’t second guess your own instincts. Your instincts will not steer you in the wrong direction. Have you heard the phrase: shuffle your feet, lose your seat? Somebody else could buy your house out from under you while you’re counting sheep. You’re not the only home buyer looking for a house to buy with your specific criteria. You might not know it, but there are other home buyers with similar intentions looking at homes today in the very neighborhoods where you want to buy. The last thing you want to hear your buyer’s agent say is another buyer made an offer and it was accepted minutes before your offer was submitted. Happens all the time, too. Unless you’re buying a brand new home, there is not another home around the corner just like the home that now you can’t buy. When you find that house, buy it. You Want to Go Inside the HousePart of the excitement of looking at homes is not knowing which could be your new home when you pull up to the curb. Is it the one on the left, or does the house on the right strike your fancy? If it is the house on the right, and you like it better than the house on the left, that could be a sign. It means there is something about this house that appeals to you. The House Embraces You the Moment You EnterWithin 3 seconds of entering the house, you will know whether it feels warm and comforting. Does it seem to speak to you? Does the house invite you to explore? Does it feel, well . . . right? Like home? Then it probably is. You Don’t Feel Funny in the BathroomSometimes buyers feel so uncomfortable near a bathroom that they won’t walk into the room. They are afraid to let their feet touch that bathroom floor. They will stand outside, grab the door frame, and poke their heads in for a minute. If you can walk into the bathroom and feel compelled to open the shower door or stroke the vanity marble, this is your house. You Are Possessive About the HouseMaybe your agent points out a flaw and says, “There is a stain in the kitchen sink,” and you want to slap her face for saying something so mean about this house. You want to defend every flaw you see. If you even see the flaws, because right now, flaws do not matter. 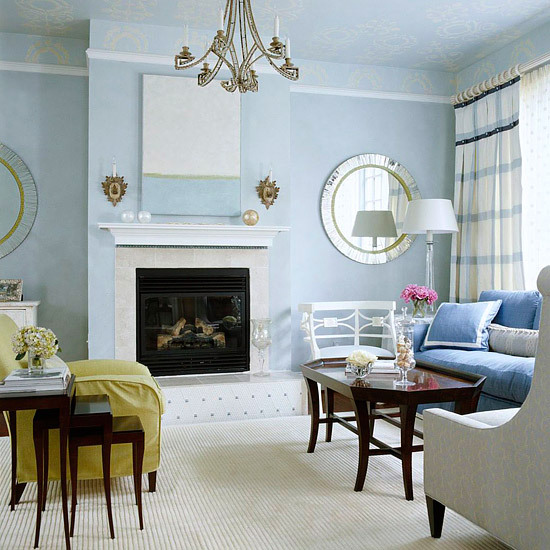 You Begin to Envision Furniture ArrangementIf you walk into the master bedroom and immediately can envision your bed against a particular wall, this might be your house. If you find yourself thinking that the living room window is a perfect spot to put a tree come Christmas, you’re already hooked. You Can See Yourself Painting a Wall Your Favorite ColorPerhaps deep purple is not your favorite color. Maybe it’s blue. Maybe you’re thinking those purple walls in the kid’s room would look better in a pale blue jean color. In fact, you might even know the name of the paint color you plan to use because you’ve been thumbing through Pottery Barn catalogs and this home looks just like those. The House Fits Your Basic NeedsThe dynamics might not hit every bullet point on your list, but it meets the basic requirements. The house has the number of rooms and space you need. Maybe it doesn’t have a garage, and in a flash of enlightenment you realize that buying a house with a garage is not important. Maybe you suddenly realize you could build a garage. Being flexible about which issues are deal-killers is a good quality. 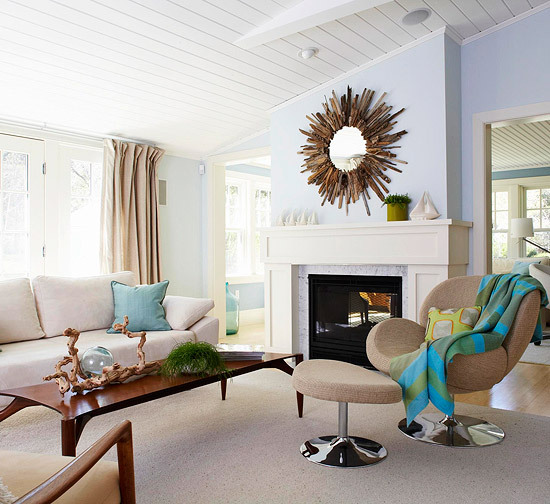 You Want to Stop Looking at Other HomesAll of the other homes you’ve been looking at no longer appeal to you. The homes on that list you’ve been carrying around seem insignificant. Moreover, the homes you had previously rated a #8 have now fallen to a #2 rating. The homes you have seen pale in comparison. You would feel like a traitor to this home if you went to visit other homes. This is it. You Can’t Wait to Brag About This House to Your FriendsIt would not be unusual for you to snap a few photos and text message your best friend before you’ve finished touring the home. You feel excited. The excitement seems to manifest itself. You shoot more photographs. Suddenly your phone is in burst mode and before you realize it, you have hundreds of photos. 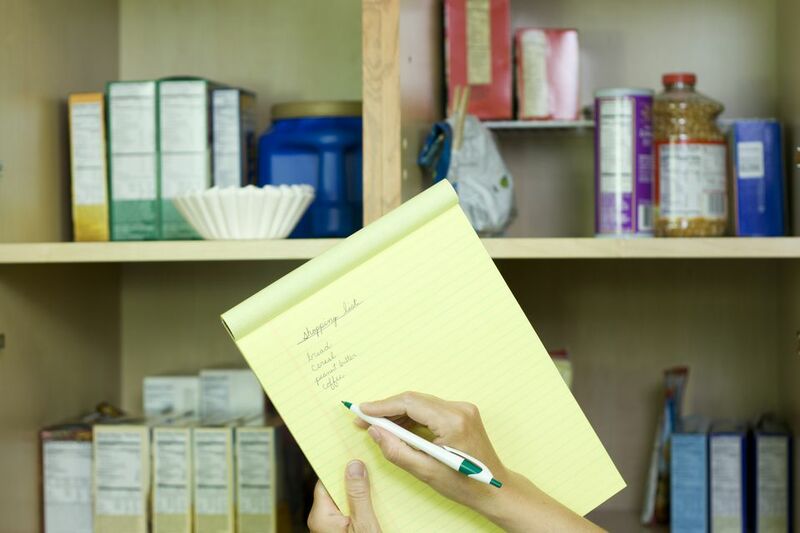 Organizing your pantry can be a relief for the home cook. Knowing where your go-to items are, and have a system in place to re-stock the pantry when necessary will help you out on many fronts: with being more organized at home, in planning meals, and with grocery shopping. If you’ve been putting this task off for a while, I’ve got three really great reasons for you to finally tackle it this weekend. Spoiler alert: it will save you money, it will save you time, and it will teach you about your shopping, eating and cooking habits. This is valuable information when you’re trying to budget and meal plan. The first step in the pantry organization process (after deciding to get your kitchen pantry organized) is to declutter the pantry. 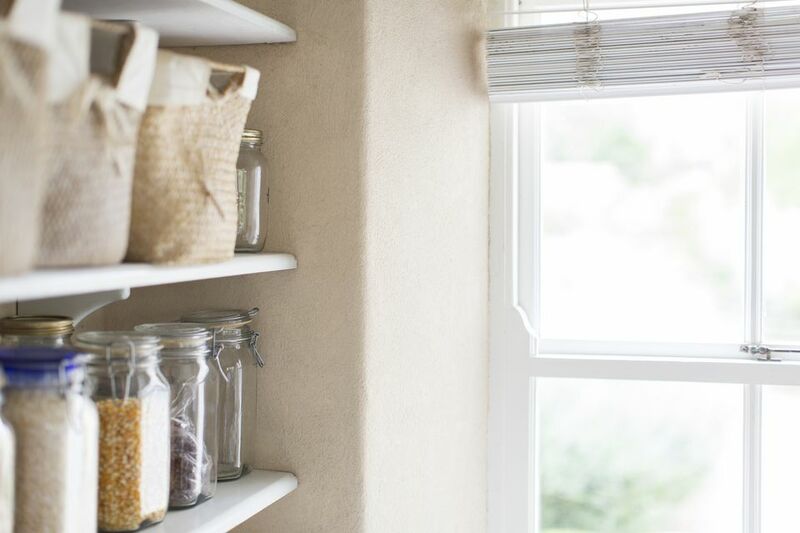 Commit to having a clutter-free pantry. Why? It’s just so much easier when you don’t have to shuffle around clutter to get to the stuff you really need. You’ll have less waste because less food will go bad, you’ll save money because you won’t buy duplicates, and you’ll save time because getting dinner on the table is a lot faster when you can quickly find what you need. 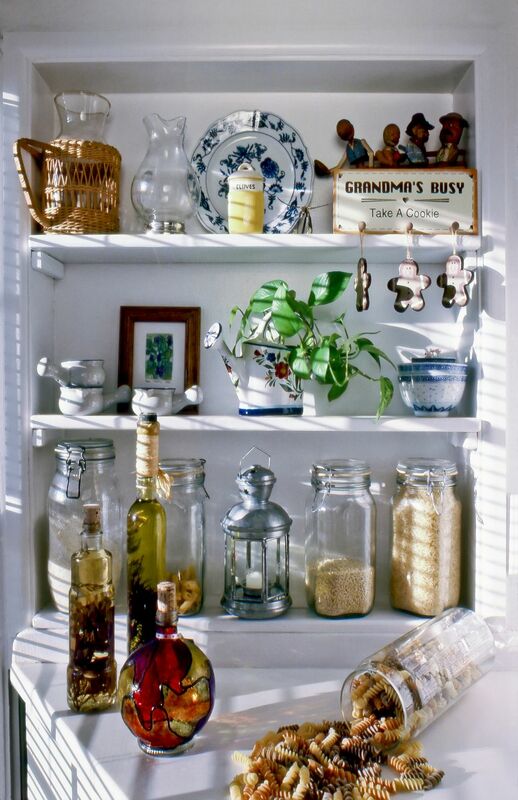 Dust the pantry, starting with the highest shelf, and then wipe down each shelf one at a time. Be sure to cover the tops of doors and check the ceiling for cobwebs. Those Harry & David gift bags are delightful to receive in the mail, but once I’m done eating the canned nuts, the scone mixes and bags of dried fruit tend to go stale in the back of my pantry. One way to combat this is to bake any mixes and give them right back to the person who gifted you in the first place. Like the saffron example I shared or anything else that strikes your fancy walking through the grocery store. You may be thinking “I’d like the be the kind of person who eats anchovies more often.” Again, only buy new/interesting items if you are committed to using them right away. I never buy junk food because I don’t think a bag of potato chips or a box of cookies would survive more than a few hours in my pantry without being devoured. But if you regularly buy junk food you may find bags of Lays potato chips about ¼ full of crumbs, some stale popcorn remnants, or broken cookie pieces. When I used to move into new apartments each year, I would line things up in my pantry and kitchen cabinets by size and height. This makes sense on a visual level but doesn’t exactly make for the best organizing scheme. 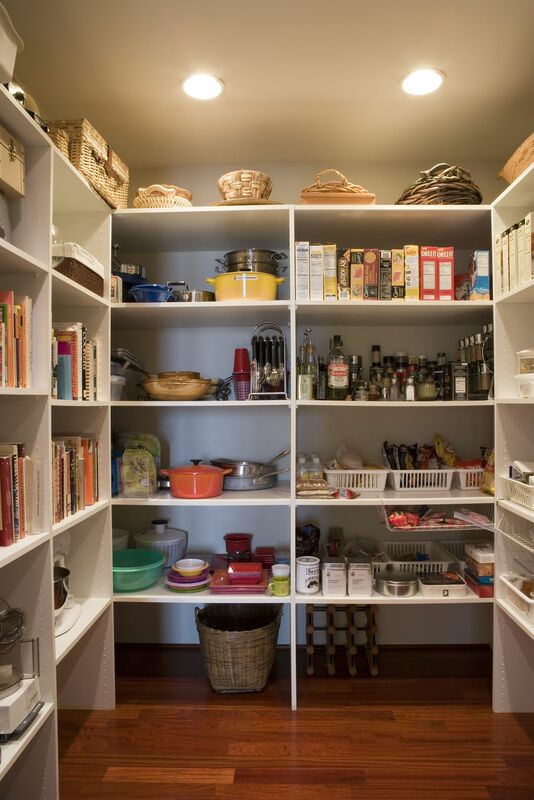 Arrange items in your pantry by group, not by size. Not only will this look logical in your pantry, it makes sense for cooking, too. I have a vinegar group which includes: champagne, apple cider, balsamic, rice wine. To that mix I’ve added white cooking wine, olive and grape oil, and an olive oil spray. The bottles vary in height and width, but now when I want to make a salad dressing, everything I need is occupying the same space in my pantry. 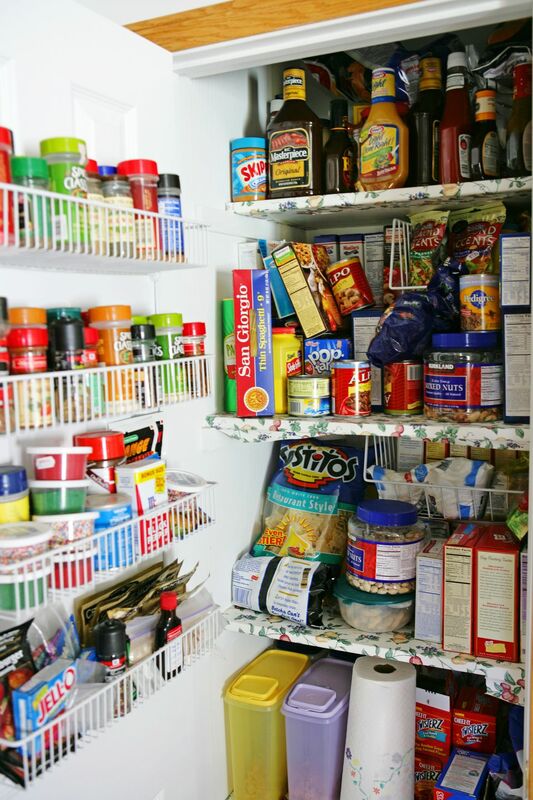 Then, arrange items at the right height in your pantry. First, keep the items you use most regularly in your prime pantry real estate. This means the space between your shoulders and knees. It’s easier to reach and easier to put back after use. I recommend items you buy in bulk be stored in the bottom of the pantry (because these items are typically heavy), snacks be up top so you have to reach for them, and spices at eye-level. Choosing the right pantry storage solutions is a biggie. I firmly believe you can properly store everything in your kitchen pantry without the aid of any storage solution. Too often people (including me!) reach for their credit card to solve a problem they could easily fix with extra 5 minutes to think it through and some elbow grease. That said, kitchen storage solutions do come in handy if you’re for more space.